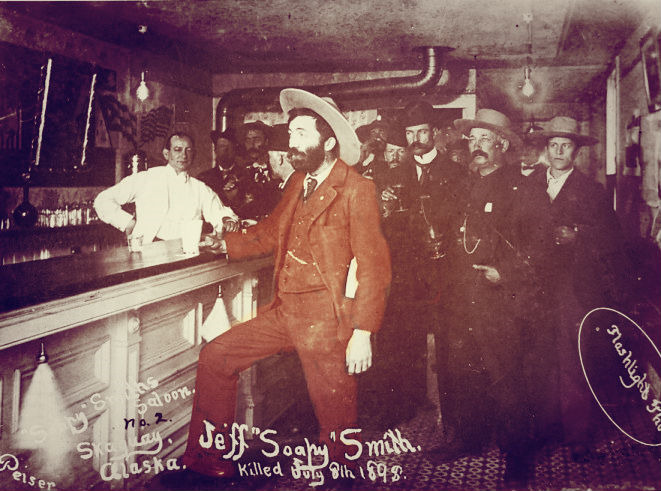 I don’t always remember names but I remembered this one: Soapy Smith. About a year ago, I read borrowed a copy of The Klondike Quest by Pierre Berton. The book belongs to my mother in law and carries great sentimental value as it was a gift from her sister who moved to the Yukon several years ago. 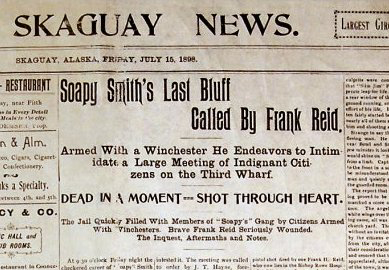 I read a phrase discretely tucked away in a caption on page 36, “… Jefferson Randolph ‘Soapy’ Smith, the confidence man who became Skagway’s dictator.” A brief sentence followed stating that Smith died in a gun fight. This scant information conjured wild west images of shoot outs and gunslingers. Confidence man, I soon learned, is another term for con artist. Last summer, I crossed paths with Soapy again in Charles Wilkins’ Wild Ride: A History of the North West Mounted Police 1873-1904. On the same page as the above a photo (featuring a group of his gang members), there was a second photo of a sign posted by a vigilance committee. They were sworn to ridding Skagway, Alaska, of criminals, namely Soapy Smith’s gang. The men and women of the 1890’s who sought their fortunes in the Klondike endured horrendous conditions in order to do so. Upon arriving in Skagway, they were understandably anxious to assure family back home safe conclusion to their journey. They were greeted into Smith’s telegraph shop where they’d pay a substantial fee to send a telegram. There was one hitch. Legitimate telegraph lines didn’t exist in Skagway until 1901. The telegraph wires used by Smith’s operator passed through the wall of the office but were not connected to anything outside the building. The newcomers were fleeced. Smith owned an assortment of businesses that specialized in cheating patrons. His gang members often dressed as clergy or newspaper men to greet newcomers to Skagway. They would gain a person’s confidence, then direct them to a prearranged location where a second thug would lie in wait. After robbing the victim, the criminals would invite the victim to join the gang. If the victim declined the offer, Soapy would appear, dressed as preacher, and give him enough money to return home. Soapy’s followers numbered 150. The men shared a common lack of conscience and a pension for violence. In addition to operating in his establishments, they also turned their trade in saloons and brothels owned by others. They befriended patrons, invited them to play poker, then proceeded to cheat them out of their gold. Business owners turned a blind eye to illegal activities and accepted a cut of the profits. Some businesses paid protection money to the scoundrels as well. The Wild Ride tells the reader that Smith procured the allegiance of the US Marshall by doubling the salary paid to him by the Skagway authorities. In her book, Gold Diggers, Charlotte Gray goes on to explain that the marshal also enjoyed a portion of Smith’s ill gotten gains. Live by the sword, die by the sword. Soapy Smith met a violent end on July 7, 1898, when he and his men victimized the wrong miner. They cheated the man out of a sack of gold dust valued at around $2 800. When the miner challenged Soapy and his crew, they snatched the gold and fled. The vigilance group demanded the immediate return on the man’s gold but the thieves refused. 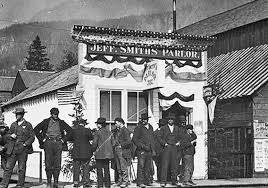 The following evening, Soapy Smith and one of his guards died in a gun fight at the waterfront. While not an admirable character, Smith certainly is a fascinating one. He was born to a wealthy and highly educated southern family. His father was a lawyer and his grandfather, a plantation owner. The family fell to financial ruin after the civil war. Smith operated in Texas, Colorado and finally, Alaska. The path that lead him to this life interests me. I’ve but scratched the surface here and will certainly return to the topic of Soapy Smith. He sparks my imaginings and will most certainly become the foundation of a future character. How did he earn the nickname “Soapy”? Please leave a comment. I’d love to hear from you. 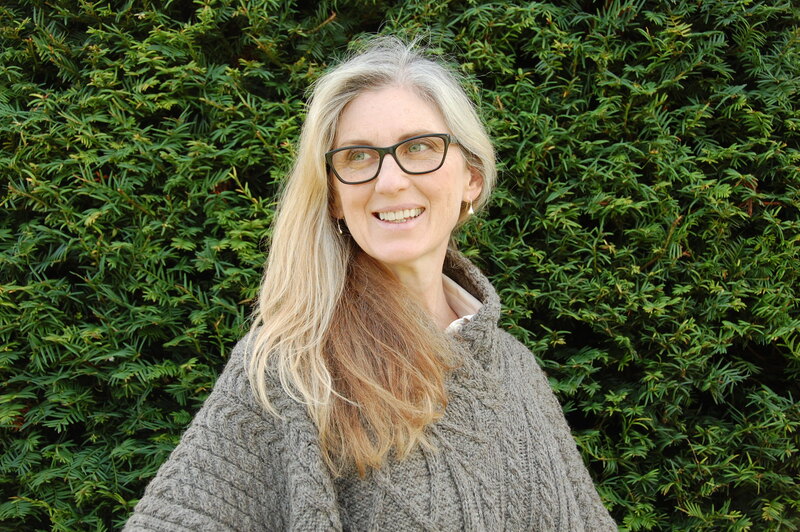 Gwen Tuinman is a novelist, born and raised in rural southern Ontario. She draws on her psychology background to create complex characters shaped by nature, nurture and circumstance. Her storytelling is influenced her interest in bygone days. Sign up for The Wellspring Podcast, blog posts and other news–delivered monthly to your inbox. Gwen Tuinman is a novelist, born and raised in rural southern Ontario. She draws on her psychology background to create complex characters shaped by nature, nurture and circumstance. Her storytelling is influenced by an interest in bygone days. Gwen lives near Toronto with her husband and two chickens.